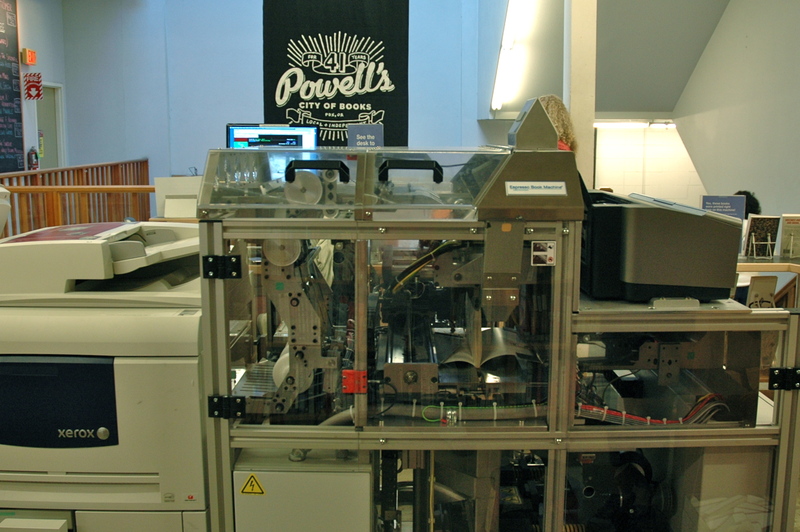 Yesterday I drove to Powell’s Books, headed upstairs to the purple room and watched the Espresso Book Machine print the proof copy of my collection, Brave on the Page: Oregon Writers on Craft and the Creative Life. It’s (almost) a real book! Whoo hoo! Copy editor Annie Hille and cover designer Gigi Little were on hand to participate in the festivities, and to ooh and ahh over the finished product. A few interested spectators came by to ask questions and see how the Espresso Book Machine works. Here are some photos of the proof being printed. 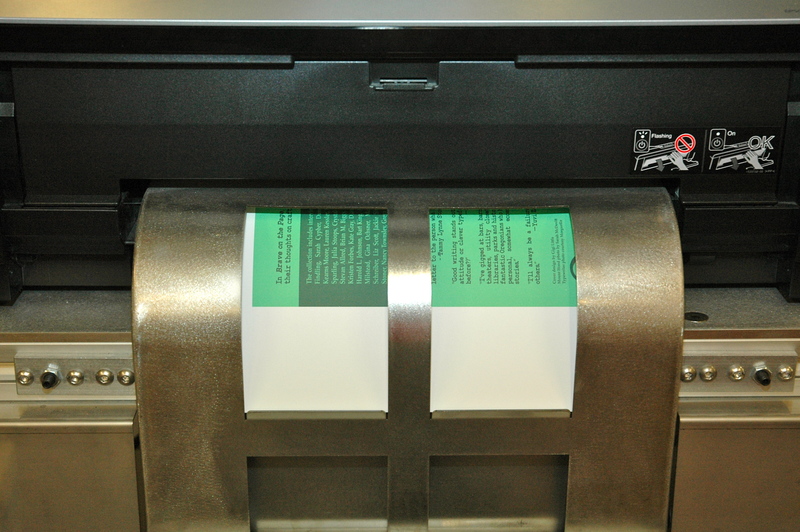 Polly Duggan, a staff member at the Powell’s Espresso Book Machine, loads lovely cream paper for my book. Here’s a sneak peek at part of the back cover. I’ll reveal the cover online on October 8, our launch date! 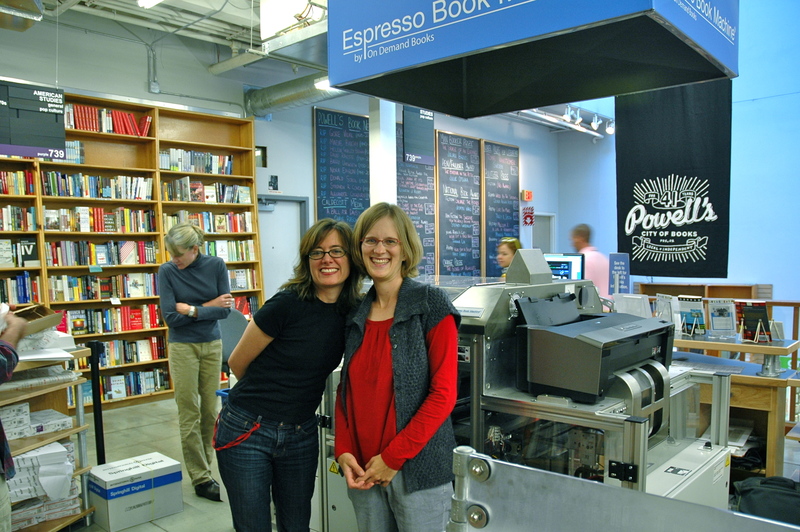 Gigi Little and I stand in front of the Espresso Book Machine as the first copy of Brave on the Page gets printed. How cool is that? You can see the pages standing up. I think that’s the moment when the cover glue was getting applied, although I was so excited I didn’t take notes. 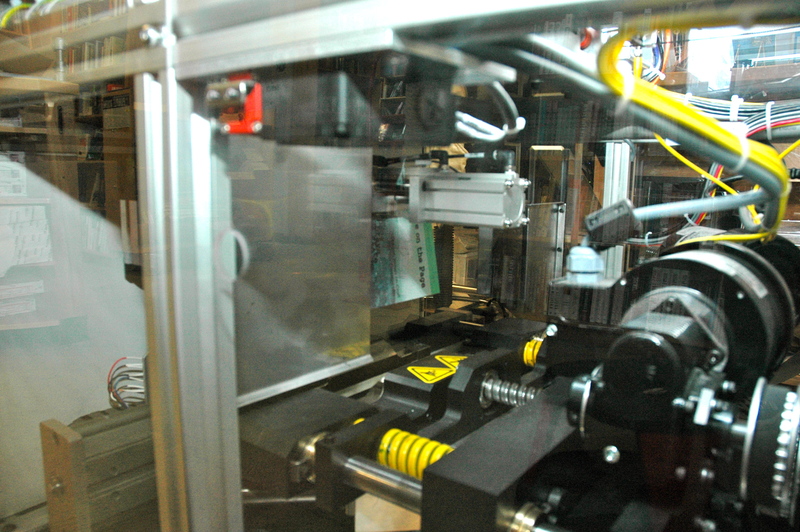 You can just glimpse some of the front cover as the now-finished book travels through the machine on its way to the chute where Polly retrieved it for us. I love the reflections of other books on the surface of the machine’s case. Brave on the Page will soon join all those other titles out in the world. This entry was posted in Books, Espresso Book Machine, Writing and tagged author interviews, Brave on the Page, creative life, Forest Avenue Press, Laura Stanfill, Oregon writers, proof copy. Bookmark the permalink. Yes indeed! Monday the 8th. I can’t wait to unveil the cover that morning! It doesn’t get much more palpably exciting than that! I have the book launch on the 09-Oct on my calendar at work so hopefully no one will schedule a meeting on top of it. I’ll cross my fingers for you, Duncan! 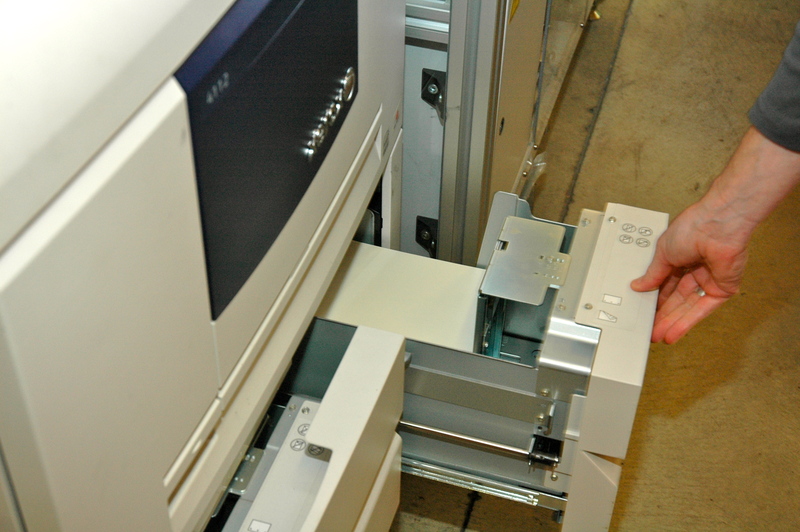 It’s amazing to watch the book–our book!–get printed. Thanks, Emma! I always love your enthusiasm. Yes indeed, Jon! I’m so glad you’re a part of this project. Thanks for working with my deadline and getting the interview together. It’ll be fun to post your piece here on my blog, too, in a few weeks. It’s so fun to be working with new technology and pushing the way others look at it by doing something different–i.e. publishing other writers and setting up a press, instead of just self-publishing. We’ll see how the adventure goes! No, you didn’t dream it—you did respond! That’s strange…. It’s a little bit of miracle, isn’t it? Congratulations, Laura! What a triumph. I have to admit the three of us spent a lot of time giggling and taking photos. Have I seen the printing process all the way through? Sort of… but I was distracted by how momentous the moment felt! Oh goody! If you take a photo of yourself at the Espresso Machine, or your hands holding the book, or just the book at the Espresso machine or your local bookstore, you’ll be guaranteed a prize! Details to follow on launch day.